This version of the Airhead Shockwave is made to comfortably fit two daring riders. The Shockwave is known best for its special topside stabilizer fins. 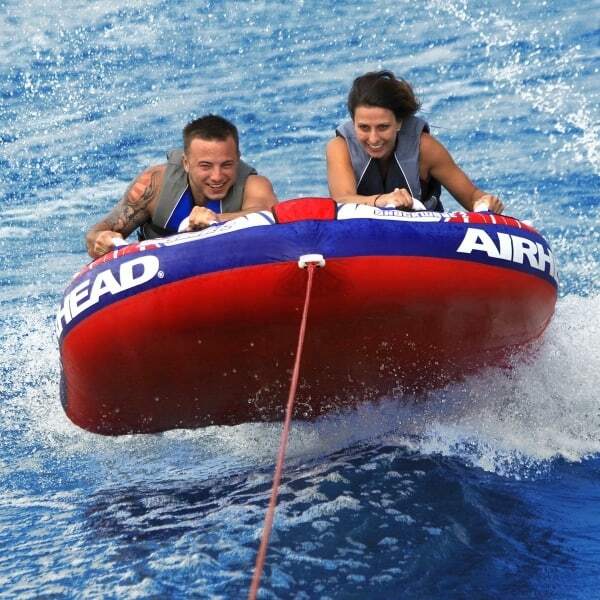 The stabilizing fin structures are comfortable but help the riders to leverage strength and balance to remain atop the inner tube for more excitement and thrills. And, it keeps the riders separated from one another to aid in protection from collision and other injury. The deluxe handles are nylon-wrapped and feature neoprene knuckle guards for a comfortable grip. The Shockwave has a tough heavy gauge virgin vinyl interior that is made to weather the rough and tough open water of regular use. The bladder is fully covered with a durable double-stitched nylon cover to keep the bladder in mint condition and riders in comfort. You’ll enjoy the ease of inflation, deflation and hookups made possible by the Kwik Connect and Speed Safety Valve.